Sit upright and well back in the seat. Adjust the position of the seat forward or backward to ensure the pedals can be reached and easily depressed to the extent required. Adjust the seatback so that the controls are easily operable. 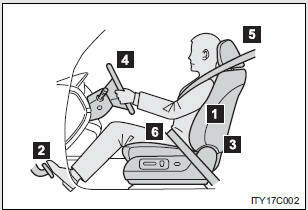 Adjust the tilt and telescopic positions of the steering wheel downward so the airbag is facing your chest. Do not adjust the position of the driver’s seat. A cushion may prevent correct posture from being achieved, and reduce the effectiveness of the seat belt and head restraint, increasing the risk of death or serious injury to the driver or passenger. Objects placed under the front seats may become jammed in the seat tracks and stop the seat from locking in place. This may lead to an accident. The adjustment mechanism may also be damaged. Do not recline the seat more than necessary when the vehicle is in motion, to reduce the risk of sliding under the lap belt. If the seat is too reclined during an accident, the lap belt may slide past the hips and apply restraint forces directly to the abdomen or your neck may contact the shoulder belt, increasing the risk of death or serious injury.